The Retiro Park is Madrilenian city dwellers favorite green area, the place where we feel in pure nature without moving away from our habitat, the asphalt. 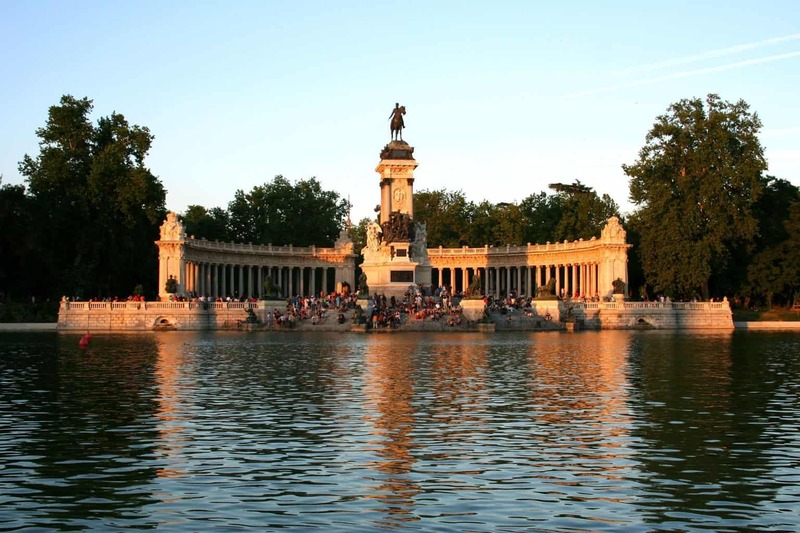 The Retiro is a park full of history. It was created between 1630 and 1640 as a part of the Buen Retiro Palace, promoted by the Count-Duke of Olivares -Philip IV’s favourite- for the relaxation and amusement of the king. Along the gardens of this palace balls and bullfights were celebrated, as well as water games at the Big Pond. Theatre performances were specially appreciated. Plays were written by the most famous poets, such as Lope de Vega or Calderón de la Barca and no expense was spared in order to give performances as much sensationalism as possible; among the actors and actresses sometimes even was María Calderón, the king’s lover. There was also an aviary with exotic birds and a sort of a zoo where wild animals from all over the Spanish empire were exhibited. But the relationship between royalty and this area of the city was already old when the palace was built. The Catholic King and Queen founded there the Royal Monastery of Saint Hieronymus, that had a Royal Chamber (although the chambers were more than one) for them to stay. This Royal Chamber was expanded by Philip II, who used it for his spiritual retirements, activity that gave name to the palace and gardens: The Royal Complex of the Good Retirement (Real Sitio del Buen Retiro). Charles III was the first king to allow Madrilenians to enter the park, provided they would observe a minimum of tidiness and propriety rules. He didn’t like much the Palace of the Retiro, so he moved to the Royal Palace as soon as it was finished (he was the first king to live there). However, he promoted some important changes in the gardens as part of the refurbishment of the Prado Promenade. These refurbishments and changes were linked to the ideas of the Enlightment that marked his reign. A part of the Retiro was devoted to cultivation and pastures and a farming school was established. The Royal China Porcelain Factory of the Retiro was created, inspired in the one that Charles III himself had founded in Naples, the Royal Factory of Capodimonte, when he was the king in those territories. The king promoted the creation of an Astronomical Observatory too, designed by architect Juan de Villanueva. This Observatory still exists, but the China Porcelain Factory was lost, as well as much of the Palace and gardens, as a result of the Independence War against Napoleon during 1808-1813. After that, Ferdinand VII tried to recover the lost splendour of the Retiro gardens. The Palace was destroyed but for a two small parts that still exist, called Salón de Reinos -the Crown Hall- and Casón del Buen Retiro -the Ball Room. Ferdinand VII embellished the gardens with new elements, called Caprices, such as the Artificial Mountain, the Fisherman’s Cottage, or the House of the Beasts, a zoo that lasted in the Retiro till the second half of the 20th century. After the Glorious Revolution in 1868, the park passed from the Crown to the City Council, even though by then it was smaller than the original one. After this important change of property, some new elements were added, such as the Car Promenade, the Crystal Palace and the Palace of Velázquez. Through all these historical changes the Retiro has become the park that we know nowadays. The possibilities for enjoying it are boundless. You can relax on the grass while reading and sunbathing, have a ride on one of the boats at the Big Pond or feed the carps, but be careful not to overfeed them; one of these carps, known as Margarita, weighed 11,5 kilos! And she is not the only famous animal in the history of the Retiro. A little elephant called Nerón, that used to live at the House of the Beasts, was chosen for fighting against the bull Sombrerito in an uncommon bullfight in which he didn’t come out very well because he was too docile for his opponent. Simply going for a walk is a perfect activity in order to discover the secrets of the Retiro, such as the Rose Garden, the Flower Bed or the Gardens of Cecilio Rodríguez, as well as its many fountains and sculptures, the Fallen Angel among them. This was a very celebrated sculpture made by Ricardo Bellver, but very controversial too due to its topic, as well as for its altitude, because it is 666 metres over the sea level. And maybe while walking you will find the elf of the Retiro, who according to legend used to change the flowers in the garden for Philip V to see them always new and different while strolling along the gardens. Skating, running, seeing a marionette performance or simply having something to drink are some other little pleasures that the Retiro, one of the most important green areas of the city, offers to us. Enjoy!